Canelim is Natural Herbal Cancer Fighter! Fight Cancer with Natural Herbal Remedies! Free Shipping to USA on orders over $80. Recent medical studies found that a large number of herbal therapies are effective in cancer treatment. Canelim (Ping Xiao) tablets are one of these therapies. 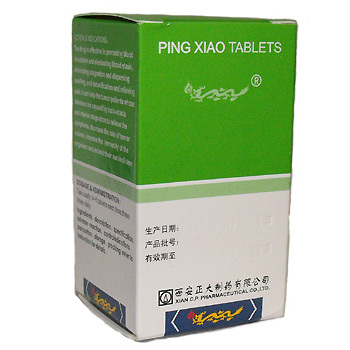 Canelim (Ping Xiao) tablets showed to be effective between 53.2% and 86%. Canelim herbal tablets are based on Traditional Chinese Herbal Medicine proven by centuries and have been successfully used in combination with chemotherapy, radiation therapy and surgery, for decades. Canelim (Ping Xiao) tablets are a Chinese herbal remedy that herbalists believe will shrink tumors. We cannot claim that Canelim tablets are a cure for cancer, however clinical studies concluded that Canelim (Ping Xiao) tablets have the ability to reduce symptoms of cancer of the bone, brain, lung, stomach, liver, esophagus, and breast. Canelim tablets are especially effective in the treatment of mammary gland hyperplasia, with the ability to shrink tumors, restraining growth symptoms of cancer, enhancing the body’s immunological ability, thus increasing life expectancy. Canelim (Ping Xiao) herbal tablets are officially approved by the Chinese Drug Administration as a drug for cancer. They are successfully used in many Chinese hospitals to treat many types of cancer. The curative and rejuvenating products from Canelim.com , are not a substitute for treatment prescribed by your doctor. Nor is the information intended to diagnose or prescribe. State and Federal Food and Drug laws prohibit representing that herbs, though reported successful in other countries, treat, cure or alleviate any disease. If you have a medical problem, don't hesitate to seek advice from a competent medical practitioner. � Copyright 2005-2017 Canelim.com All rights reserved.